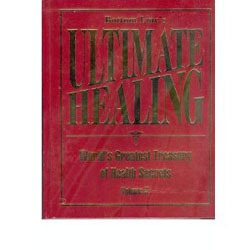 Ultimate Healing presented by Hugh Downs is a book that claims to have new cures. treatments and preventives for heart disease, cancer, arthritis, diabetes, memory problems, nearly any kind of chronic pain. THe book contains 576 pages of information. With your help we can reach more people and let them know about Ultimate Healing with Hugh Down whether this product works or not. has a lot information, probably too much. excercise is a good starting point to a lot of issues.